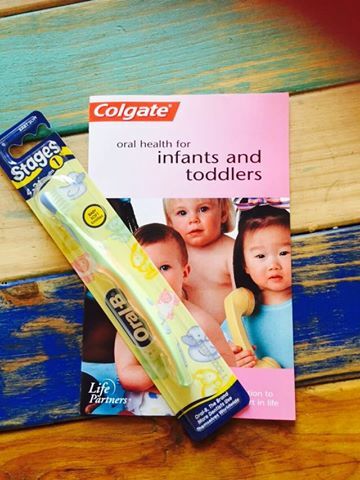 I went for my normal check up and clean yesterday, and when I was leaving my dentist handed me a little baby toothbrush and pamphlet as a little congratulations – While super pleased with this, I was more shocked at the age on the front of the packet. 4-24 months – babies have teeth from 4 months! Naïve me had no idea these little chubby monsters developed teeth from such a young age and all I could think of was ouch, and not for the baby! So if these baby teeth only eventually fall out, why is it so important to care for them now? A HUGE amount of reasons, but here’s my top ones. These teeth actually help your baby form speech – they aid in the development of them learning to talk, so obviously a very vital thing to protect! They help them eat – dah. When babies move from only drinking liquids as the main form of nutrition, they’re going to need a bit of help with the lovely mushed up pumpkin! Probably one of the of biggest reasons is they help place the adult teeth. So if there is any problems with decay or rotting, this can seriously affect the way their adult teeth move down and set permanently in their mouth. When should I start taking them to the dentist? Check with your personal paediatrician, as it will depend on how many teeth your baby has, however as a general rule of thumb anytime from 1 year old, or 6 months from first cutting of teeth. They should then go every 6 months after that – some Dentists don’t even recommend seeing babies until they’re 3 years old, so you can always check with your local dentist on their advice also. Where can I take my baby to get their teeth checked? Your own dentist will most likely be able to see your child as well, however for a dentist that specialises in this you have a few options. Dentalspa have also got this handy info page about the new Child Dental Benefit from the government which can help with covering the costs. Have you found a fantastic child dentist in your area?